The Anson County Chamber of Commerce will hold its 21st Annual Big Game Hunt Tournament on November 23rd through 24th, 2018. The Big Game Hunt Tournament is organized by the Anson County Chamber of Commerce and its membership. The event reaches all of North Carolina with a targeted presence in the five-county area of, Anson, Montgomery, Richmond, Stanly and Union counties with exposure to 15,000+ people. Attendance for the event is estimated at more than 500 people for the two-day event. We recognize your company as being an aggressive, community oriented, and professionally minded company and would like to encourage you to become a sponsor of this exciting high-profile event for our area. 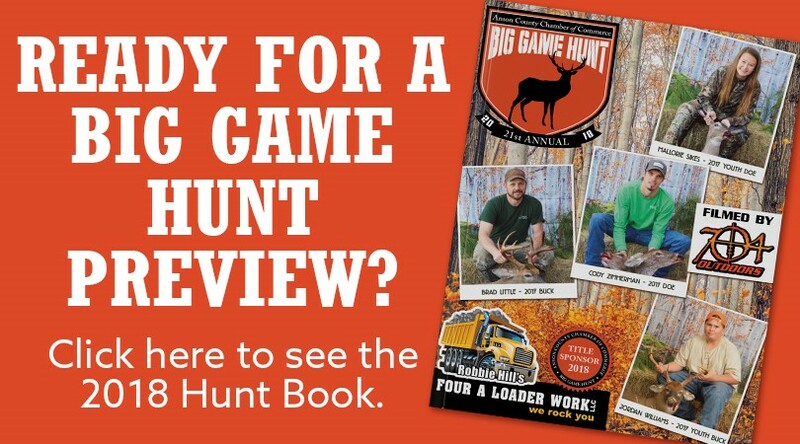 We are excited about the prospect of having you involved with the Big Game Hunt Tournament and hope you will agree it is a great marketing and advertising opportunity. We believe our sponsorship opportunities will assist in name recognition and visibility for your business, as well as the possibility to increase volume through product sales. With a sponsorship commitment your company will be associated with one of North Carolina’s largest and longest running events. The Anson County Chamber of Commerce is a non-profit organization. Our success depends on the support from our community and the exceptional generosity of companies like yours. You can find the detailed marketing and advertising information regarding levels of Big Game Hunt Tournament sponsorships attached. Please call us at our office at (704) 694-4181 or feel free to email us at info@ansoncountychamber.org if you have any questions. All mail correspondence can be sent to the Anson County Chamber of Commerce, P.O. Box 305, Wadesboro, NC 28170.